RESTON, Va. – A first-in-human study featured in the February issue of The Journal of Nuclear Medicine reports that the novel positron emission tomography/computed tomography (PET/CT) tracer 18F-GP1 showed excellent image quality and a high detection rate for the diagnosis of acute venous thromboembolism (VTE). Well-tolerated in patients, 18F-GP1 PET/CT also identified blood clots in distal veins of the leg below the knee, where conventional imaging has limitations. Acute VTE is a disease that includes deep-vein thrombosis of the leg or pelvis and its complication, pulmonary embolism—which can be fatal. The highly variable and nonspecific symptoms and signs of VTE often result in delayed or inaccurate diagnosis. For acute VTE, timely and accurate diagnosis is critical to expedite the initiation of effective therapeutic strategy. Researchers conducted a prospective study to obtain clinical proof-of-concept for thrombus PET imaging with 18F-GP1. The safety and diagnostic performance of 18F-GP1 PET/CT were assessed in 20 patients with acute deep-vein thrombosis or pulmonary embolism (10 deep-vein thrombosis and 10 pulmonary embolism). Each patient had signs or symptoms of VTE and had one or more VTE foci confirmed by standard imaging. Upon image review, researchers found that 18F-GP1 uptake in thromboemboli was easily distinguishable from the blood pool. Moreover, a positive correlation was observed between 18F-GP1 uptake and P-selectin expression on circulating platelets, which shows the presence of activated platelets and acute VTE. 18F-GP1 PET/CT detected thromboembolic foci in all 20 patients with deep-vein thrombosis or pulmonary embolism. Additionally, 18F-GP1 PET/CT showed an increased uptake in the distal veins of the leg in 12 patients that was not detected with conventional imaging. 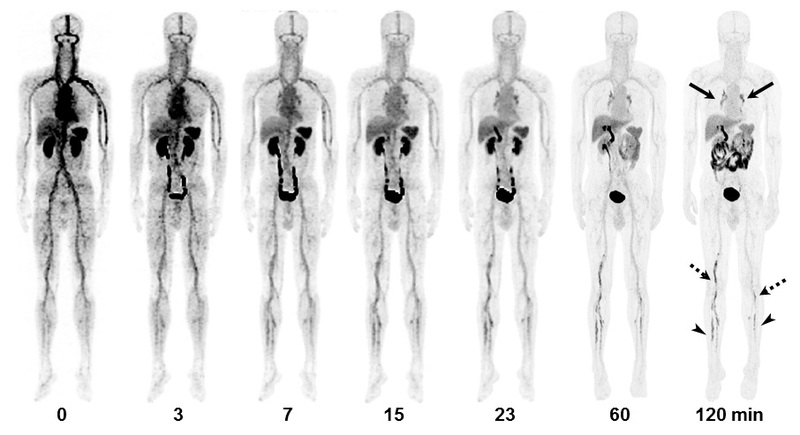 Figure: 18F-GP1 PET/CT and CT images of 55-y-old man with DVT and PE. Anterior maximum-intensity projections of 18F-GP1 PET/CT over 120 min show positive 18F-GP1 accumulation in pulmonary arteries (arrows) and in proximal (dotted arrows) and distal (arrowheads) veins of leg, which are gradually distinct on late images as 18F-GP1 activity from other organs is excreted via both urinary and hepatobiliary tracts. Credit: Kim C, Lee JS, Han Y, et al. The authors of “Glycoprotein IIb/IIIa Receptor Imaging with 18F-GP1 PET for Acute Venous Thromboembolism: An Open-Label, Nonrandomized, Phase 1 Study” include Chanwoo Kim, Sun Young Chae, Changhwan Sung, Hye Joo Son, Seung Jun Oh, Sang Ju Lee, Jungsu S. Oh and Dae Hyuk Moon, Department of Nuclear Medicine, Asan Medical Center, University of Ulsan College of Medicine, Seoul, Republic of Korea; Jae Seung Lee, Department of Pulmonology, Asan Medical Center, University of Ulsan College of Medicine, Seoul, Republic of Korea; Youngjin Han, Yong-Pil Cho and Tae-Won Kwon, Department of Vascular Surgery, Asan Medical Center, University of Ulsan College of Medicine, Seoul, Republic of Korea; Soyoung Jin, Department of Nuclear Medicine, Nowon Eulji Medical Center, Eulji University, Seoul, Republic of Korea; Deok Hee Lee, Department of Radiology, Asan Medical Center, University of Ulsan College of Medicine, Seoul, Republic of Korea; Seongsoo Jang, Department of Laboratory Medicine, Asan Medical Center, University of Ulsan College of Medicine, Seoul, Republic of Korea; Bohyun Kim, Department of Laboratory Medicine, Soonchunhyang University Hospital Cheonan, Soonchunhyang University College of Medicine, Cheonan, Chungcheongnam-do, Republic of Korea; and Norman Koglin, Mathias Berndt and Andrew W. Stephens, Piramal Imaging GmbH (now Life Molecular Imaging GmbH), Berlin, Germany. For questions or to set up an interview with the authors, please contact Rebecca Maxey at (703) 652-6772 or rmaxey@snmmi.org. Current and past issues of The Journal of Nuclear Medicine can be found online at http://jnm.snmjournals.org.